Welcome to our vacation rental. 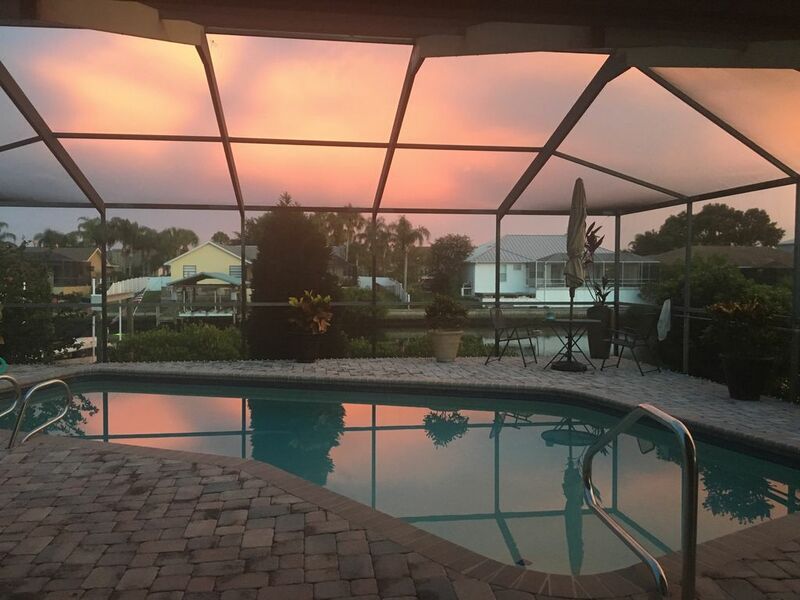 This gorgeous home is a 3 bedroom 2 bathroom pool home located in Apollo Beach and will make the perfect getaway for you and your family or your and your significant other. The home is newly renovated with upgraded features, stainless steel appliances, an enclosed saltwater pool you can enjoy and a screened in patio area. Wake up to see fish jumping, dolphins swimming and manatees from the water view in the back of the house. Four rooms open up to the pool area and bring outdoor living inside. The master bedroom has a king size bed, and private bath along with a 32" TV. The master suite has a sliding door that leads to the pool. The 2nd bedroom has a queen size bed and looks out to the water. The 3rd bedroom has a twin bunk bed on top and full bed on bottom and leads out to the pool on one side and a water view on the other. This room also has a 32" TV in the bedroom with a DVD player. These two back rooms have a private bathroom with granite counter tops and can be closed off for privacy. a 60" Flat Screen TV in the living room. Love to cook? You'll love the kitchen which has granite counter tops and upgraded steel appliances, filtered water system and a view of the pool as well. Love to Swim? Enjoy beautiful sunrises and sunsets in the heated pool. The pool as LED light that can change colors to match whatever mood you're in. You're a short 15 minutes to the Bay from the house. Tampa Bay is where you can fish, swim, check out the dolphins, just hang out or see a water view of St. Petersburg and Tampa. We know you need to stay connected so we are including cable and fast wifi and netflix for you to enjoy. We also have a video library, book library and games! Apollo Beach is a quiet and friendly waterfront community. You and your family can boat year-round, fish, and be outside. The Apollo Beach Golf Course is less than a mile away and you can see the course from in front of the house. Love beaches? You'll have a hard time wanting to leave home but if you do, it's a short drive to Clearwater Beach which was named the #1 Beach in the United States by TripAdvisor. You may also want to check out St. Pete Beach, so many beaches to choose from! Baseball not your thing? How about hockey? Check out Tampa Bay Lightning Bolts and of course there is always football. Whether you like College or NFL you're covered. Home of the Tampa Bay Buccaneers! And can't forget about Soccer. Yes we have that too! A short 1.5 hour drive to Disney makes it easy to drive over and back in a day. The location of the water, ability to have our own boat, the pool, the neighborhood. 4 rooms open up to the pool area. Perfect for entertaining, or that quiet evening in. You can fish off the dock, see dolphins, manatees or wake up to see fish jumping in the water behind it. 15 minutes from the Bay, bring your boat and store on the 10,000 lb lift. Automatic coffee maker, uses cone filters. 8 full set of dishes, pots, pans and utensils. We do have some videos to select from, including childrens. Our stay in this beautiful Florida home was spectacular. Easing into the day as the boys found time to fish the channel and watch the crab trap, while others chose to take a swim before getting into our day. Breakfast and evening meals cooked and served inside and on the patio. The home was well equipped to suite all our needs, very nice flatware and cookware. We look forward to a return visit. We had a great time at the house and in the area. The house was the perfect place for us to stay. The house was clean, well cared for and the pool was AMAZING! Thank you for choosing us and please come back, we loved having you! Beautiful hone! Great comforts from home away from home! Outside of a hiccup with the lock code (which was resolved ASAP) our stay on Eagle Lane was wonderful! What a beautiful home to relax in! So many great amenities and comforts of home it truly felt like our home for the week! Who knew the ability to wash sandy swimsuits and beach towels would bring such joy! Our kids LOVED the pool and swam whenever possible! They also had fun fishing off the dock and watching the wide array of movies available in the house! Enough space and privacy for our family...if we ever return to the area we will definitely be back to stay in this beautiful home! We had everything we needed. The home is clean, well maintained. We fished off the back dock, swam a lot and enjoyed a family movie with the family room big screen. Pam was attentive and even the neighbors were so kind. Property manager checked in once to make sure all was ok! We left some kitchen goodies behind, it’s getting well stocked! Our Aim is to stay again next winter break. We just love the Apollo Beach area! We stayed at Pam and Rich’s place for just over two weeks and had a terrific time. Just as others have said the house is exactly as pictured. Clean and stocked with essentials. Pool is lovely and the neighbourhood is quiet and neighbours are very friendly. Greg and Suzie are great caretakers! We used the kayak, paddle board and fishing rods. Nice little restaurants in the area. Grocery stores are nearby. Golfed at the club down the street. Went to Dunedin to see our Jays in warm up. Made it to Epcot for a day. Pam was kind enough to put us in touch with a terrific pet setter so we didn’t have to rush back. One of the best vacations we had yet. Thank you for the wonderful review! I am so thrilled you were able to fully experience everything the home and area have to offer! The home was clean and comfy. Our kids love the pool and used it every day. Pam and Suzie we're amazingly helpful. I highly recommend this place! Thanks for a memorable trip!